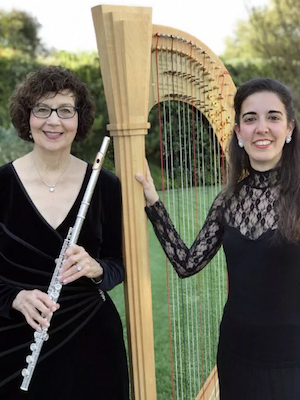 Harpist Cristina Montes Mateo and flutist Susan Greenberg will perform a sold-out show at Pepperdine University's Raitt Recital Hall on Sunday, October 28, at 2 PM, as part of the Recital Series. Their program, entitled Around the world..., includes Jean Cras’ Suite en Duo 14', Nino Rota’s Sarabande e Toccata per Arpa, Astor Piazzolla’s Histoire du Tango for Flute and Harp, Adrian Schaposhnikov’s Sonata for Flute and Harp, Manuel de Falla’s Spanish Dance N.1 from ‘La vida breve’ for Harp, Jesús Guridi’s Viejo Zortzico for Harp, and Bernard Andrés’ Narthex for Flute and Harp. As the unanimous first prize winner in the XII edition of the Torneo Internazionale di Musica (Rome, 2006) and the unanimous first prize winner in the International Harp Competition V. Bucchi (2009), Mateo is recognized as one of the leading harpists of her generation throughout the world. She has also won top international prizes at the Arpista Ludovico International Harp Competition (2005), the International Nippon Harp Contest (2007), and the Concours International de Harpe Lily Laskine in Paris (2011); as well as numerous national harp solo competitions like the Jeunesses Musicales Competition (2003) or Victor Salvi Special Prize at the Arpa Plus Contest (2001). Mateo’s intensive career as a soloist has lead to great success around the world. She usually appears with major orchestras like the Ensemble Orchestral de Paris, Philharmonic Orchestra of Málaga, Francisco de Miranda Orchestra in Venezuela, Orchestra of the Theatre für Niedersachsen Hannover in Germany, and the Santiago de Chile Orchestra under the direction of B. Haitink, Sir Colin Davis, G. Prêtre, P. Boulez, or D. Barenboim. She performs at many world leading festivals like Les Flâneries Musicales de Reims (France, 2010), the International Harp Festival in Rio de Janeiro (Brasil, 2012), or her most recent success at the Royal Palace in Madrid (Spain, 2015), in a concert for the kings of Spain and the president of the United Nations, Ban Ki-moon, which was broadcast on national television. She is currently solo harpist at the Orquestra de la Comunitat Valenciana in the Palau de Les Arts Reina Sofía, an orchestra created by Lorin Maazel and conducted also by Zubin Mehta, Valery Gergiev and Riccardo Chailly. She has also been principal harp with the Munich Philharmonic Orchestra and the Royal Liverpool Philharmonic Orchestra. A sought-after teacher, she is also head of Harp Department at the Conservatorio Superior de Música Joaquín Rodrigo of Valencia (Spain). She has also given master classes at renowned institutions, including Berklee College of Music (2014–2016), the Birmingham Conservatoire (2015), and the Musikhochschule für Musik und Tanz in Cologne (2016). Mateo also serves as adjudicator of main harp contests. She has been one of the jury members of the 12th and 17th Edition of the famous “Arpa Plus” Competition held in 2010 and 2015, as well as a permanent jury member of the harp auditions at the National Youth Orchestra of Spain since 2012. One of her most important works is her album Obras para arpa (2012), with 11 premières by Spanish female composers. Her recently released solo album Voyage (2017) has also become a huge success with critics and audiences. Mateo lives in Los Angeles where she shares her solo concert agenda with the recording sessions in the greatest studios in Hollywood. Flutist Susan Greenberg enjoys a versatile career as soloist, chamber musician, symphony player, and recording artist. The Los Angeles Times has described her playing as "brilliant," "elegant," and "supple," and has lauded her "panache" and "musical projection." During her 36 years with the LA Chamber Orchestra, she was a frequent soloist on both flute and piccolo, premiering a concerto for piccolo by Bruce Broughton and performing a concerto for flute, alto flute, and piccolo written for her by Gernot Wolfgang. Greenberg has also appeared as guest soloist with the San Francisco and Oakland Symphonies, the Santa Monica Symphony, the Napa Valley Symphony, and at the Hollywood Bowl. Presently she is the principal flutist with the Santa Monica Symphony and the Vicente Chamber Orchestra. She has performed with the Los Angeles Philharmonic, LA Opera, New York City Opera, American Ballet Theater, as well as at the Casals, Ojai, and Martha's Vineyard Music Festivals. Greenberg was the principal flutist for the Hollywood Bowl Orchestra’s tour of Japan, and has received the "Most Valuable Player" award on the flute from the National Association of Recording Arts and Sciences. She received both her bachelor’s and master’s degrees from University of California, Los Angeles. She won a scholarship to both the Academy of the West and Tanglewood. Greenberg is presently the flute professor at Pepperdine University and Santa Monica College. She has also taught at California Institute of the Arts, Occidental College, and El Camino College. She is the co-artistic director of Chamber Music Palisades, now celebrating its 22nd season. Greenberg has recorded for over 500 motion pictures and many television shows, including The Simpsons, for 25 years. For additional information about this sold-out performance, visit the Center for the Arts website.